One of the easiest ways to understand other cultures, peoples and the like is “to walk a mile in their shoes”. Or so they say. And by they I of course mean the nameless face and majority that is society. Or variations of it depending on the hemisphere you’re coming from. A rather elegant way of doing this, while also avoiding any faux pas while you’re trying to use the wrong fork/chop stick with the wrong dish, is to literally view the world as they see it from your very own living room. Try it. 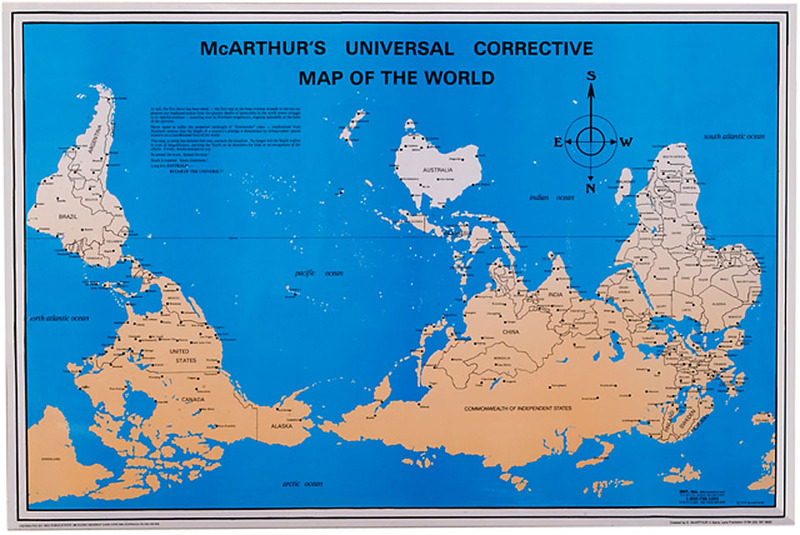 Take a map of the world and flip it upside down and then stare at it for 2 minutes. Or more. Really, go for it right now there’s a really good one right bellow from Steve Tamari’s blog, Inside the Middle. One of the most commonly found object in a study, or a library or a school is a world map. And ours is the one that shapes the western view of the world. Whenever we think about it we see that map in the back of our minds. But if you take the time to think about it, get some perspective and start looking at the world from a different standpoint you’ll start to notice all the similarities but most importantly all the differences. Your turn now. What’s it like to see the world through somebody else’s cultural inception?